It seems that I can’t get too far away from thinking about food and blogging, even if I wanted to. Last Monday, I had a day off from work and I had planned on a rmuch-needed day of rest and relaxation. I was going to read magazines on my iPad, get a mani/pedi, and order some takeout from my favorite Chinese restaurant down the street. I wanted a day away from the blog, which meant no cooking, writing, and taking photos. I even banned myself from Pinterest to try to disconnect from anything that might remotely lead me back to the blog. I made myself a cup of coffee and heated up one of the chocolate pecan cinnamon rolls I had made the day before for Easter brunch and started to catch up on the magazines I hadn’t had time to read. I read the last two issues of In Style, and this month’s Sunset. After that, I absent-mindedly clicked on the link to view April’s Bon Appetit, forgetting all about my self-imposed day-long hiatus from “food.” Before I knew it, I landed on this page, and I knew I had to make it at once. What was to be a leisurely day away from the kitchen disappeared, with just one click. I was off to Whole Foods for ingredients, anticipating how good this bread pudding would be for lunch (and dinner!). Whole Foods did not have broccoli rabe, but they did have these baby broccoli, so I opted for them instead. Beautiful, aren’t they? 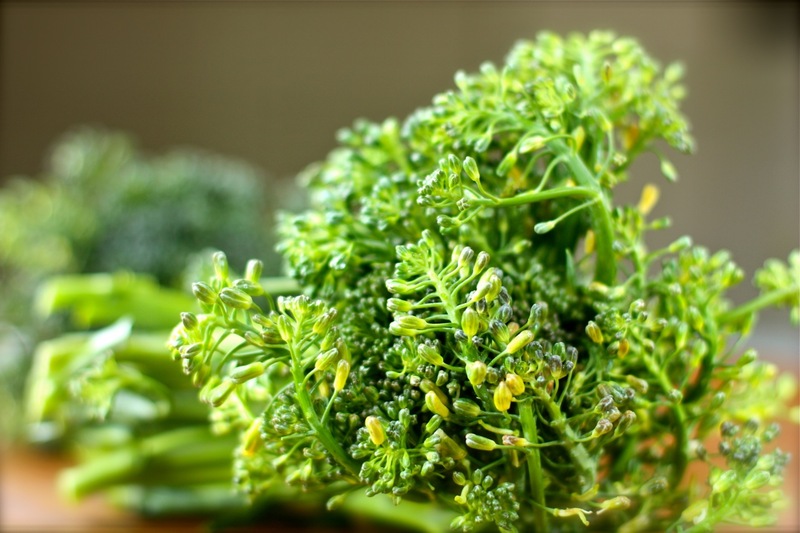 Baby broccoli, I found out, is a cross between broccoli and Chinese kale. It is sweeter and more tender than regular broccoli. It has a mild peppery flavor with just the slightest hint of mustard. I did end up spending the rest of the morning in the kitchen and some time in the afternoon taking photos. No mani/pedi. No Chinese takeout. However, there was pancetta (lots of pancetta), so it’s all good! I tweaked the recipe to put my own spin on it by adding more spices and herbs, mushrooms, and even more pancetta (Italian bacon). The result was an absolutely fantastic savory bread pudding that was full of flavor. The peppery baby broccoli was a delicious complement to the saltiness of the pancetta and parmesan cheese. This is a perfect brunch dish, although I must say it made for a wonderful dinner, as well. 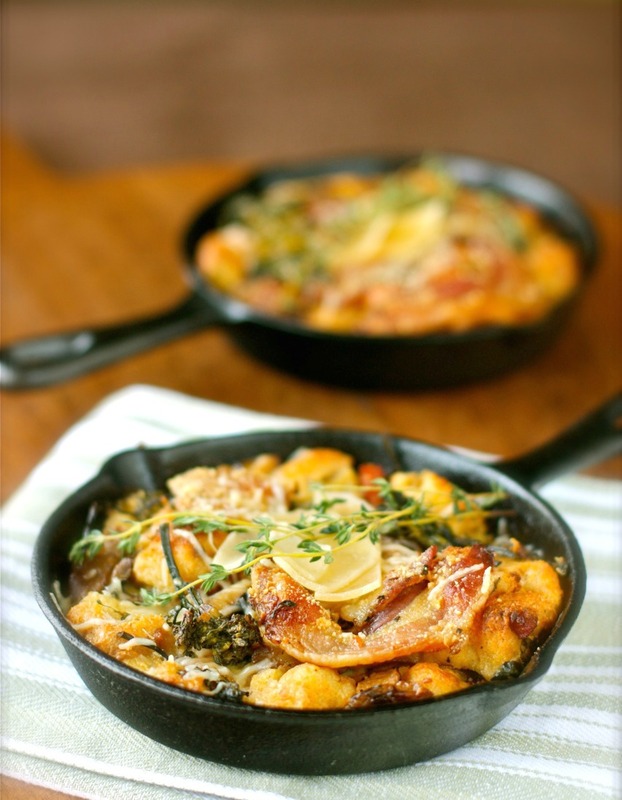 Cook the pancetta in a large skillet over medium heat until lightly browned, about 5 minutes. Drain most of the drippings, except for 1 tablespoon, or if needed, add additional olive oil to equal 1 tablespoon. Add garlic and cook until fragrant, about 1 minute. Add diced shallots. red pepper flakes, and thyme and cook for another minute. Add mushrooms and cook until softened, about 3-4 minutes. Add the broccoli and cook until wilted, about 2 minutes. Season with 1/2 teaspoon salt and 1/2 teaspoon fresh black pepper. Deglaze pan with white wine. Remove from heat and let cool slightly. Meanwhile, combine the eggs, milk, remaining salt and black pepper, ground mustard, and paprika in a large bowl and whisk to blend. Add mushroom/broccoli mixture, bread, and 1/2 cup Parmesan to the custard and toss to combine. Transfer to a 1 1/2-quart baking dish or 6 individual heatproof ramekins or mini cast iron pans. Top with sliced pancetta and remaining 3 tablespoons Parmesan. Bake bread pudding until puffed, toasted and browned in spots, and set in the center, 40-55 minutes depending on the size of the baking dish. Adapted from Bon Appetit Magazine, April 2013. Reblogged this on Nurturing our future. Great post. The photos look awesome. Everything looks so mouthwatering. Oh wow. 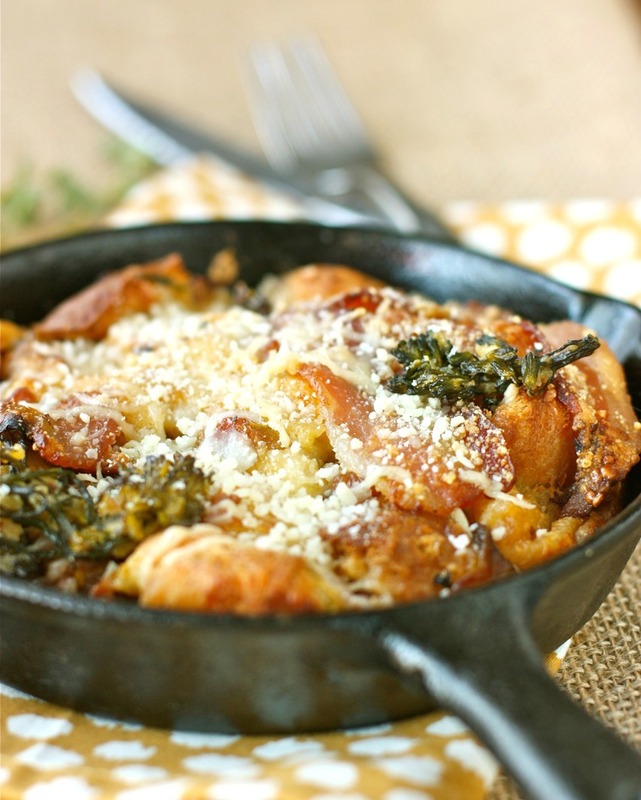 I love broccolini, but I never would have thought to put it in a bread pudding. This looks amazing, and fancy enough to impress anyone. Awesome! That looks like some serious comfort food!